The decade of the brain, the brain mapping programs, the explosion in neuroscience globally - these have all brought about a new understanding of the three pounds of meat stuffed into our noggins. What used to be an inaccessible mass is slowly becoming an open book. What that means is that we have to start thinking about our brains, how to care for them, feed them and exercise them in new and better ways. Robert Burton, the physician and authour, sits down this week with the Brainiac bookclub to discuss some of the ideas encapsulated in his most recent book A Skeptic's Guide to the Mind: What Neuroscience Can and Cannot Tell Us About Ourselves. This week on the Brainiac book club we're all about trying to teach ourselves better ways to, well, teach! Dr. Mariale Hardiman, a professor at John Hopkins University School of Education studies not only how the brain learns, but how we can target teaching to work best within natural brain systems. Having a high IQ has been a mark of intellectual superiority for years, but is it really a true definition of intelligence? Some researchers argue that intelligence is instead a biological process involving multiple systems in the brain that defy such testing. Educators are using this research of how the brain systems involved in learning work to provide better methods of teaching. For many of us our memories are a diary of our lives. They are mental movies of where we've been, what we did, and who we are. However memories aren't as neat and tidy as photos in an album or videos on a flash drive. Our memories change every time we remember them and what we recall always has an account of times past imprinted in it. Out of necessity, our brain remembers as a way to predict the future, but it is never a static process. You'll notice this week that Carl Schoonover appears both in the broadcast and on our Brainiac book club, where we feature his beautiful book Portraits of the Mind. In this Think About It web exclusive you can find some of the images that are found between the covers of Portraits of the Mind. 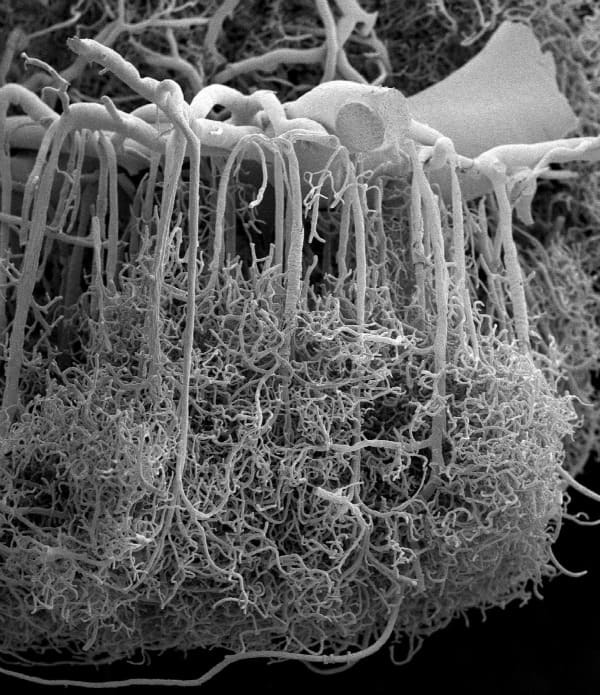 Photomicrograph of the microscopic blood vessels that carry nutrients to neurons in the brain, obtained with a scanning electron microscope. This sample, from Human cerebral cortex, shows a large blood vessel at the surface of the brain (top), which sends down thin, densely branched capillaries to deliver blood throughout the entire cortex. 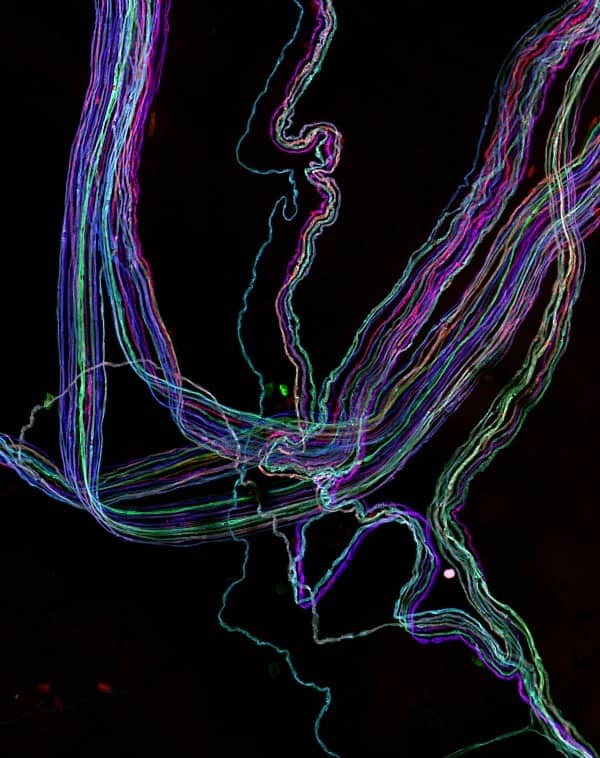 Image taken from a transgenic "Brainbow" mouse that enables neuroscientists to distinguish between neighbouring, densely packed neurons by illuminating them in different colors. This photomicrograph reveals the disposition of axons that regulate the contraction of certain muscles. 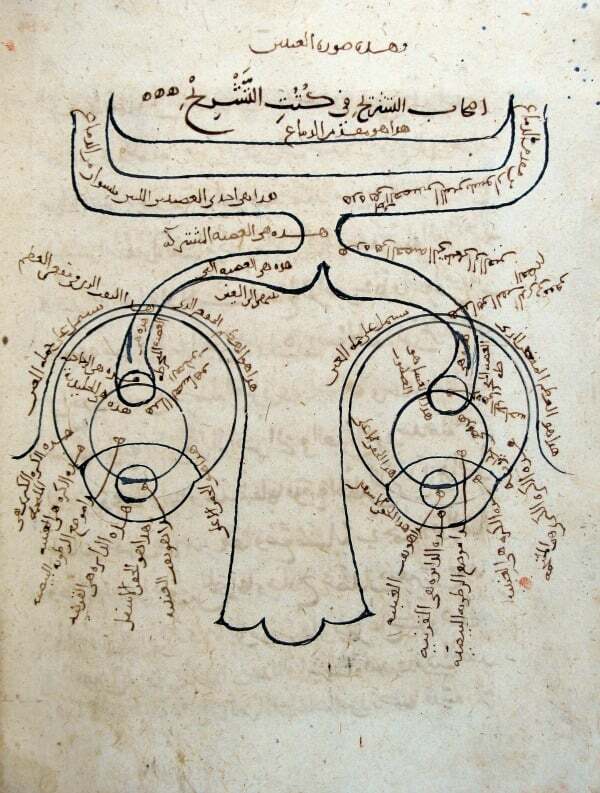 The oldest known drawing of the nervous system shows a large nose at the bottom, eyes on either side, and a hollow optic nerve that flows out of each one towards the back of the brain. From the Book of Optics. Courtesy of the Süleymaniye Library, Istanbul. 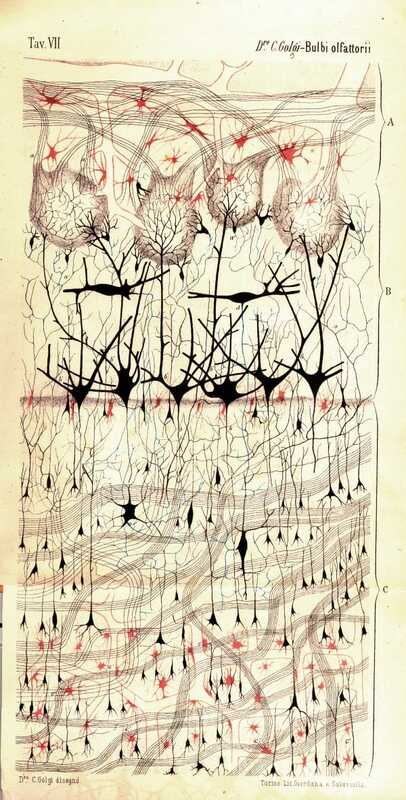 Drawing of a dog's olfactory bulb by Italian physician and scientist Camillo Golgi. The features that appear here were revealed by a revolutionary method for staining nervous tissue that bears his name. Courtesy of Dr. Paolo Mazzarello, University of Pavia - Department of Experimental Medicine - Section of General Pathology. 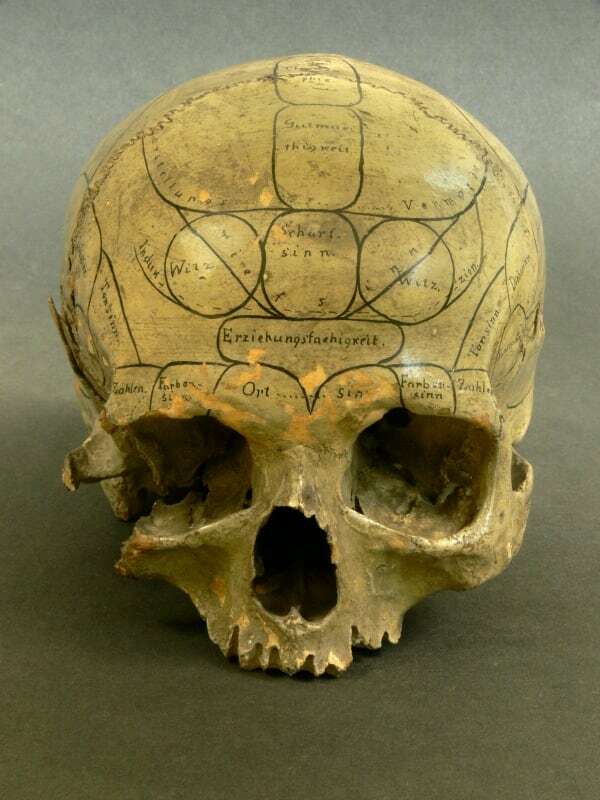 Human skull inscribed by a nineteenth-century practitioner of phrenology. According to this now discredited theory, bumps on the skull betray the volume of the brain areas beneath each one, and thus can be employed to divine a subject's cognitive or moral strengths and weaknesses. Photograph by Eszter Blahak/Semmelweis Museum. The neural circuitry in the eye transforms light into signals that the brain can understand. 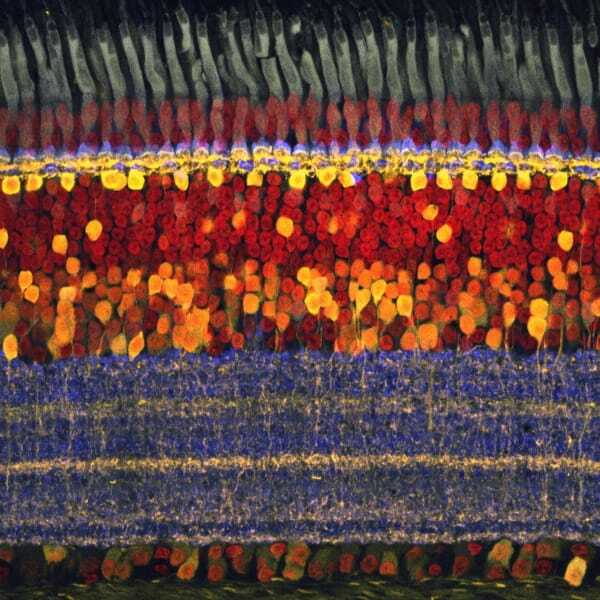 This image of a chick's retina reveals the neurons that perform this function with, at the top, its photoreceptor cells (in gray). These are the familiar 'rods and cones' that capture photons of light and translate them into electrical currents.